We invite you to explore India - the Land with infinite beauty ! Whether you soar high into Himalayas or peer under the ruins of the Ancient monuments dotting the landscape of India, you will cherish the experience long after your visit ! This India Travel Guide on Aralam Wildlife Sanctuary is free from any commercial interest! This site is dedicated to promote India - the vast subcontinent, its glorious past, magnificent landscape and its infinite variety. Located on the western slopes of the Western Ghats, Aralam Wildlife Sanctuary is spread over an area of 55 sq km. Aralam is a contiguous forest with the Brahmagiri Wildlife Sanctuary in Karnataka. The bears and the rarest species of deer are a major attraction for tourists. It is located 45 km east of Kannur and is frequented by nature lovers. This sanctuary was established in 1984 after the government of Kerala took over a private forest property. It is the northernmost wildlife reserve of Kerala. Elevations ranging from 50 meters (164 feet)to 1145 meters (3760 feet) are part of the landscape of Aralam wildlife sanctuary. The highest peak is Katti Betta - rising to about 1145m above mean sea level. Western Ghats - the longest running mountain range in South India also straddles across the 3 Southern States - Karnataka, Kerala and Tamil Nadu. This mountain range has abundant natural resources - flora and fauna and a treat to the Nature Lovers. The temperature varies according to the elevation from sea level. Temperatures range from 20 degrees to 40 degree Celsius on the plains and dips to a minimum of 8 degrees C in the areas of high altitude. The sanctuary enjoys plenty of rainfall and has several streams and rivers including River Aralam. The best season to visit this sanctuary is between September and April. Butterfly enthusiasts should visit Aralam wildlife sanctuary during November and December. Common langur, boars, elephants, sambar deer, peacocks, lion-tailed Macaques, wild dogs, common Otter and Malabar giant squirrel are found here. Bison and tigers are occasionally spotted. More than 215 species of birds flock this sanctuary. This list includes endangered birds like blue-winged parakeet, Nilgiri wood pigeon, Malabar pied hornbill, Ceylon frogmouth, and the great pied hornbill. Butterflies, venomous reptiles and fishes are wonderful to watch. 172 types of colorful butterflies would definitely be a retreat for the eyes. Aralam wildlife sanctuary has a tropical and semi evergreen forest cover and has plenty of eucalyptus and teak plantations. Cashew also grows in plenty. 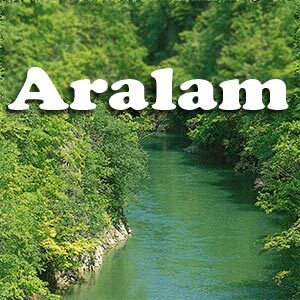 Moist deciduous and hilltop evergreen forests and plantations line the hill slopes of Aralam. Nature camps: Nature camps are mainly held for students. Others have to get special permission from the chief conservator of forests. The camps are held for 2-3 days and about 40 participants take part in each of these camps. Trekking to Meenmutty falls: Trek through 14 km of rainforests to watch this picturesque waterfall. Whilst in the area, don't miss on seeing the Chavachi waterfalls and the nearby Ambalapara Peak. Indulge in bamboo rafting and tree house stays. Aralam wildlife sanctuary is well connected by road, rail and air. You can look for accommodation in Irrity and Valayamcal. Tourists with own transportation can consider staying in Kannur and driving down to Aralam. The nearest railway station is Thalassery, 50 km from the sanctuary. Kannur has a historical fort of some significance and just about 20 km from Kannur - in Thalassery - you have another fort built by the British rulers. The nearest airport is located at Kozhikode, 113 km from Irutty. Aralam as most places in Kerala, is well connected by State Highway roads.